Sometimes, you feel you know a culture, or a cuisine, or even a person, and then you find yourself removed from said culture, or cuisine, or even person, and you realize – you knew bupkis! I spent my teen years in the Middle East eating my way through falafel, Shawarma, Fatteh, and Taboule! I grew accustomed to the fasting and closing of all business during the afternoon hours and the feasting that followed in the breaking of the fasts! I thought that in the 8 or so years I lived there, I knew all I could about the culture and the cuisine in that part of the world. But, boyoboy was I wrong…. Recently, I was thumbing through a Cooking Light magazine and came across a chicken recipe that used preserved lemons – not remembering crossing paths with said preserved lemons ever, I Googled them to find that they were quite prevalent in Middle Eastern Cuisine! In my 8+ years in the Middle East, preserved lemons had eluded me! And, my curiosity was piqued! I had to find them – but even after looking at some of the stores I go to for my more exotic ingredients – preserved lemons still eluded me! But – it doesn’t stop there! 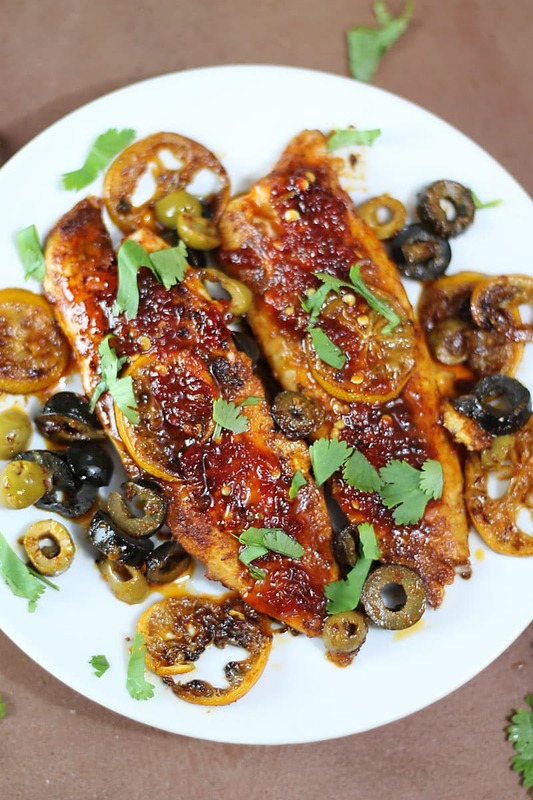 When the tilapia has cooked, soaking up the flavors of the sweetly tart lemons, the salty olives, the smoky spices…it is topped with a sauce made from Sambal Oelek and honey! Sambal Oelek is somewhat similar to Sriracha in taste, but it is mostly just ground chili peppers (without the sugar, garlic, vinegar and xantham gum that Sriracha contains) – some say it’s less spicy than Sriracha, but, if one of those chili pepper flakes hit your taste buds at just the right angle – ooh – you will start sweating! My daughter got 1/2 of her daily requirement of water just in the few minutes it took her to eat this! 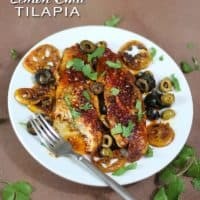 As this month’s Recipe Redux challenge was to make a “healthy dish (heated) up with smoke and/or spiciness”, I figured this dish met the challenge – this, tart and salty, simple and complex, sweet and oh so spicy tilapia! Place the tilapia into the lemon/sugar/salt mixture and turn heat up a tad - if needed add a tablespoon or so more olive oil. Let tilapia cook about 5-7 minutes (depending on thickness) and flip and let cook another 5 or so minutes till both sides are golden and fish is firm. To the same pan, add the sambol oelek and honey and let mix together over a low flame for about 3-4 minutes. Spoon this over the tilapia and garnish with cilantro. 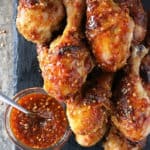 Oh man, this looks so flavorful and spicy! I love it! Preserved lemons are phenomenal, but what you did with your lemons sounds amazing! 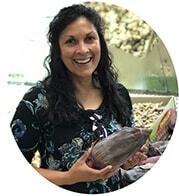 I am honored – thanks so much Sonali! Preserved lemons are used a lot more in North African cooking. ME cooking uses some, but they actually like to use dried limes more. You know, preserved lemons are just the same lemons that go into Indian lemon pickles, that’s the base before the masala is mixed in. My mom would make tonnes of preserved lemons and they would eventually end up in achaar. I make them now but for my Moroccan dishes. If you’re looking for them, Whole Foods does carry some in a jar. Anyway, this fish and those flavours….wow. Looks pretty amazing! I remember you mentioning being born in Saudi awhile back – and, I see the ME influence in a lot of the dishes you post! My mom’s cooking was mostly Sri Lankan and Indian – we didn’t really cook much ME food – but we did enjoy it at restaurants and friends places, so, anything ME totally fascinates me and brings back memories! It looks so flavourful! Made some preserved lemons years ago and I had no idea what I wanted to do with them and at the end they ended up in the bin. Oh goodness I can only imagine the flavour explosion that this dish would create…nicely done, Shashi! Love how simplistic dish looks too..clean eating at its finest :)! Thanks so much Khushboo – you are too kind! Oooo, I discovered preserved lemons a few months ago and have fallen in love with them! This spicy rub sounds fabulous for marinating proteins. Yum! Thanks so much Genevieve – I really need to get my hands on a jar of preserved lemons! With a side of eggs right? 🙂 Thanks so very much! Oh wow! I don’t often cook tilapia because usually no matter what I do to it, it tastes bland to me. But this tilapia looks loaded with amazing flavors! Love it! 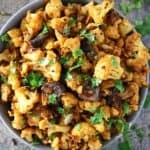 Thanks Christin – the Cooking Light magazine that inspired this recipe actually used chicken – so you could go that route too? i have seen preserved lemons being used frequently in middle eastern dishes too but never tried it. i will have to try your version and those tilapia fillet looks wonderful. love this dish. You had me at tart. I kinda like that salty tart flavor with light fish, genius! These flavors and spices sound incredible! I have always wanted to give preserved lemons a try. I could eat this everyday. 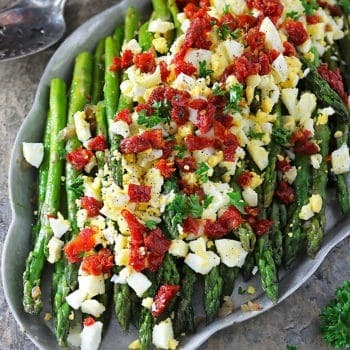 Yes, yes you must – the quickie version I tried as suggested by Cooking Light magazine added so much flavor to this – it was incredible! This does sound delicious and the preserved lemons intrigue me too. Love me some tilapia as a weeknight meal though! I’m loving all the spicy, tart, sweet flavors going on in this dish. Looks amazing! That inner voice cannot be ignored! I cannot tell you the number of times I’ve chosen to dismiss mine only to find myself screeching on the brakes – literally! Like the other day, I was driving home and that inner voice said “get off the hwy here and take back-roads home” and I said “booyah” and guess what – miles and miles of brakes around the corner!!! Grrr! Thanks David – gosh I went way off topic with my answer!!! YUM! I have a tagine and a ton of recipes I cook in it call for preserved lemons! But I have such a hard time finding them 🙁 But I NEED TO KNOW…even if I have to resort to Ebay, because this Tilapia? I WANTS IT! Pinned! Wait – you have a “tagine” – have you used it yet? Did I miss a post where you did – if so my apologies – I’ve seen them – but never used one – ooh am so curious! Btw – thanks so much sweet lady! O my goodness! Please make this for me! I’ve always wanted to cook something with preserved lemons! Ohmigosh, this sounds so good. <3 I've never tried preserved lemons, but I love what you did with yours! 😀 Yay for flavor explosions galore! You are so sweet – thanks so much Farrah! I’m such a big fan tilapia, it’s a great fish. I love that you cooked it with preserved lemons, one of my fave ingredients. This recipe is going in my to-cook list. Thanks for sharing my friend! Whoa, this looks like a flavor explosion – love it! I love preserved lemons, their sharp saltiness and zingy tang. 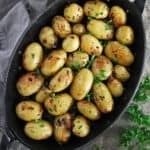 (that’s fun to say 😉 ) Definitely want to try this recipe! Today “Zingy tang” has got to be my favorite word-combo of the day! LOVE it! Thanks so much Marissa! Shashi, this looks incredible and so full of flavor! 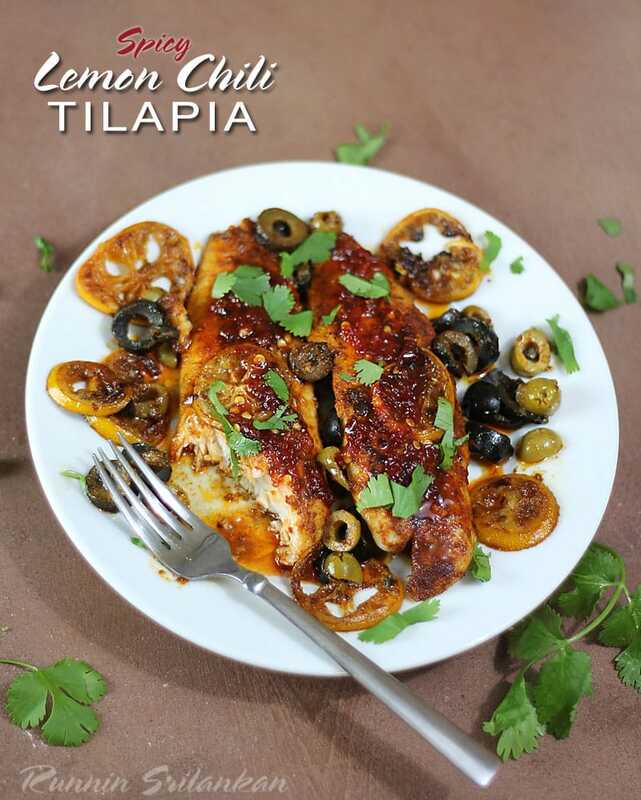 Tilapia is one of my favorite fish to cook with. I’ve never come across preserved lemons before either so will definitely try your method – love that you used chili garlic sauce in here too! Thanks so much Kelly – my daughter and I so enjoyed eating this! I want to dive right into this dish – what an abundance of flavors! Yum!! The way you described this and all of the aromas has my mouth watering!! I wondered if it was hard to make preserved lemons – sounds like something I could do!! Okay I honestly could live off fish everyday and I am ALWAYS looking for new ways to make it…this spicy lemon chili sounds so yummy! Pinning! I love this dish Shashi, and your method of cooking the lemons to sub for the preserved is fantastic. I can’t get over how wonderful this looks, it’s literally jumping out of the screen and begging to be made. This is fantastic it looks so flavorful. The spicy goodness of this fish is to die for…!! Fabulous! I’ve never made tilapia spicy. I should try that for a change. YUM! My hub will be a big big fan of you, if you served this to him. All the layer of flavors are just so darn captivating..it’s a party in a pan. I hear you when you talk about missing a few little details about a cuisine. It’s a constant learning curve everyday with everything. Middle eastern cuisine is something I enjoy and haven’t dealt a lot with. My tagine needs to be put to use, I might try this one. First, I need to learn the proper way to preserve lemon. Thanks a ton for my weekend project idea. Will let you know how that goes. Have a superb weekend, hugs to you my dear. Wow! 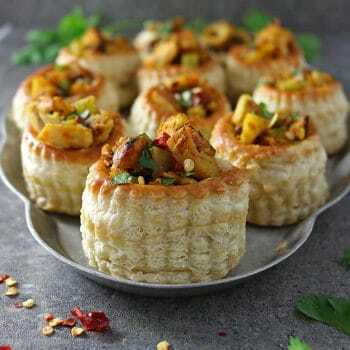 Love this dish, Shashi! What an amazing combination of flavors! We love tilapia and your spiced up version is just the ticket! Great post! Great flavors and beautiful looking fish dish. 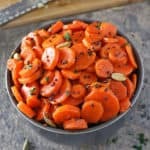 My boys would love this as it is spicy and might even want me to use even more of the cayenne pepper and spicy sambul. Sharing of course!!! I marked that same recipe in Cooking Light! I can’t believe you lived there 8 years and never came across a preserved lemon! 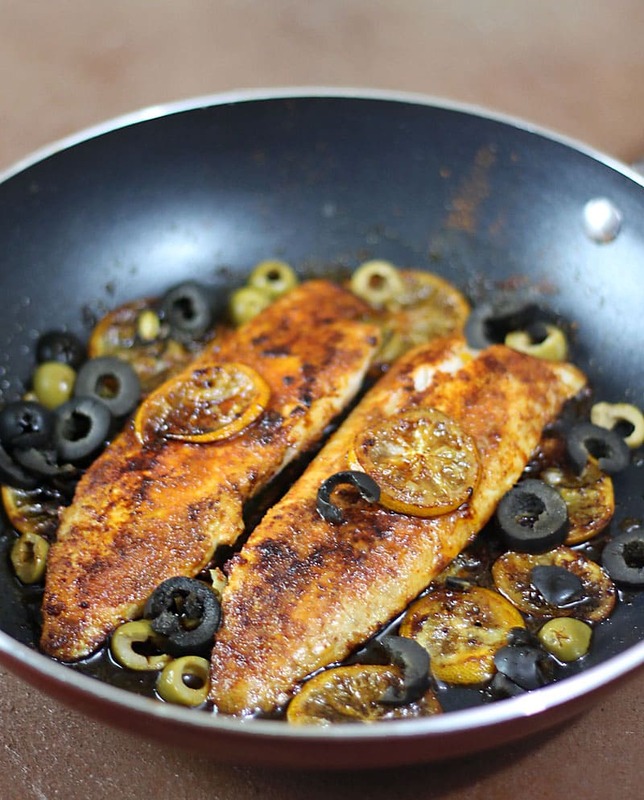 This tilapia looks fabulous! Love all the flavors and spice! Preserved lemons are quite common at my house too, though I have to admit I don’t make any. This tilapia looks fabulous. ME cusine is one of my favorite cuisines, I could survive on them, and this takes it to a notch above what I have tasted so far. Bookmarked.